CNC hardware including NCUs (6FC) and CNC boards of all types, including CPUs (6FX, 6FM). We can supply and repair and fully test a very significant number of unique references that span from all versions of the old System 3 all the way through to Sinumerik 840C/D including all versions of Sinumerik 810 and 820, including 880 and 850. However, for repairs always double check with us as some references cannot be repaired by us. 6SN1123 Servo drives, 6SN1145/46 power supply units, 6SN1118 and 6SN1111 drive boards and interfaces. 6RA, 6RB and 6SC drives and many of their C7, C8 and C9 internal boards. We supply from stock a vast range of new and refurbished Siemens Sinumerik and Simodrive hardware, both current and obsolete. 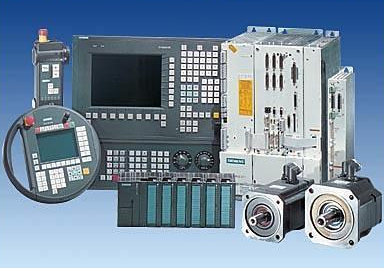 This includes CPUs, NCUs, operator panels, CNC boards and drives, power supplies and drive boards. Many companies rely on us to keep alive systems that the OEM has rendered obsolete. Our stock is large, varied and mostly tested and ready to ship, including legacy and long obsolete products. If your faulty unit is repairable, we can always get you back up and running with a quicker service exchange instead, in other words the exchange of your faulty unit with a working, refurbished and fully tested one. Unlike other companies, we have the capabilities to test the communication side of all Siemens Sinumerik and Simodrive repairs we take on, as well as the power side. So you can have the confidence that your equipment will work, when it is returned to you. As well as being technically excellent, our Siemens Sinumerik and Simodrive spares and repairs services are very well priced as we consistently beat the OEM on price, whilst delivering the same level of quality.